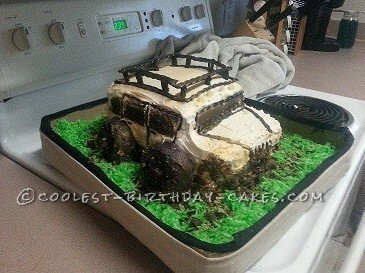 Well this cool Jeep groom’s cake was a very fun cake to make that is for sure. 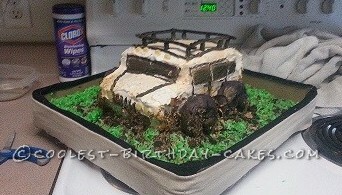 I used 2 boxes of white cake mix, a 2x8x9 in of wood for the base to hold the Jeep up high enough for the wheels. 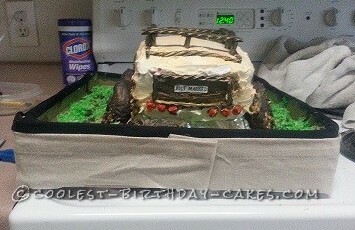 I used black Twizzlers for the top rack of the Jeep the outlining, the door handles, and the windshield wipers. The tires I used 4 cake donuts, iced them with chocolate icing and the center of the tires I used mint flavored life savers. For the ground I used chocolate whipped frosting, Graham crackers, chocolate cookies (not the filing), chocolate morsels, and shaved coconut (dyed with green food coloring). The coloring of the tires and some coloring on the actual jeep was done by color mist edible spray paint (you can get at any Hobby Lobby or Michael s stores). I put all together with lollipop sticks cut up accordingly. The cake was moist and and held together very well during transporting and all. 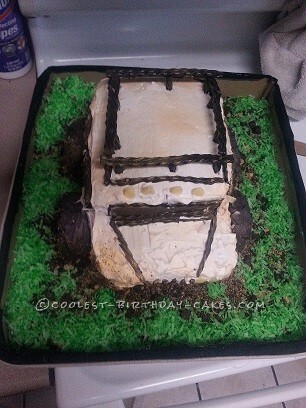 Birthday cake idea posted by Crystal I.